For over two decades, SPACENEWS has been the only publication that space professionals throughout the world turn to first for the news that affects their jobs. Whether for the latest trends in military space capabilities, breaking developments in satellite communications, or the current status of a budget, our readers count on SPACENEWS to keep them informed. For additional subscription options, please contact customer service. 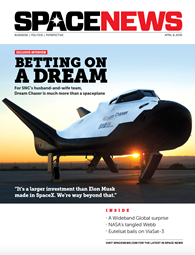 SpaceNews This Week: Delivered each Friday to your inbox, SpaceNews This Week is a subscriber only enewsletter that gives you the top stories from the upcoming issue of SpaceNews. Satellite Telecom Review: Delivered to your inbox twice monthly and highlights current news and trends related to satellite telecommunications bandwidth and bandwidth users.